eProMail offers a variety of options for mobile users, including full Mobile Sync for eProMail Webmail, an optimized eProMail Webmail Mobile Site, and secure POP/IMAP access. NOTE: If you only need to sync email (and not calendar or contacts) to your mobile device, you can do that for free using IMAP/POP/SMTP and do not need this add on. 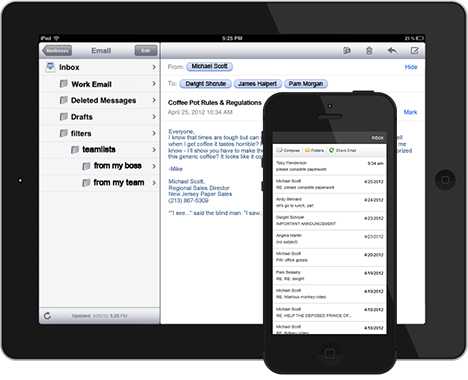 eProMail PLUS users can enjoy real-time sync of (push) email, calendars and contacts on their iPhone®, iPad®, Android® or Windows® device. Built on Microsoft’s ActiveSync protocol, our mobile sync service uses push technology to sync data instantly. You can access your eProMail account via POP or IMAP on practically any smartphone or mobile device, using your device’s native email application.